Known for their size and aggressive feeding habits, both Largemouth and Smallmouth Bass are a popular gamefish in the US and throughout Northern Mexico. Part of the reason Bass are so popular in the fishing world is because of the professional Bass fishing circuit. Tournament anglers have inspired people across the country to target these well-known species with conventional tackle. Recently, however, Bass fly fishing – Largemouth and Smallmouth – has also become increasingly popular. As spring arrives, Bass begin to spawn across the US. Fly fishing for Bass during the three stages of the spawn can be productive and particularly exciting. In the late winter/early spring, Bass feed aggressively before they spawn to bulk up and save energy. Spring Bass fly fishing can be electric; during these early weeks Bass are eating ravenously and fish are strong and hard-fighting. During the spawn, Bass become territorial and defensive. Topwater flies or flies just under the surface of the water pull Bass off their spawning beds and encourage aggressive eats. This is a stage in the Bass’ spring feeding cycle that’s sure to entertain any angler. Finally, as spring winds its way into the summer season, Bass finish spawning and can be targeted during a period called ‘post spawn’. After Bass finish their spawning routine, they again become hungry and go back to eating a variety of baitfish and other prey. Regardless of where the Bass are in the spawning cycle, spring fishing for Largemouth and Smallmouth can be incredibly awe-inspiring and very productive. In this post, I’ll take you through important tips, tactics, tackle, and techniques required to target Bass during the spring season on a fly rod. Pre-spawn Bass have a diet that is heavily reliant on baitfish, especially during warmer days in the early spring. After winter weather begins to subside, Bass leave their deep water winter habitat and ‘stage’ in shallower water before the spawn. When these fish enter shallow water, they become easier to target and more convenient for the fly angler. Typically, and this holds true for all spring Bass fishing, a 6wt, 7wt, or 8wt fly rod works best. These fly rods are larger than typical trout rods to provide increased lifting power and casting ability when targeting Largemouth or Smallmouth Bass. Some great rod options include the Redington Vice or the TFO Pro II. Because fish are at a medium water depth during the early spring, a Floating or Intermediate fly line works the best. The Rio Mainstream Bass Line Series is a great option as well as the Airflo SuperDri Ehlers Warmwater Bass Floating Line. These lines, coupled with a heavy fly that imitates the Bass’ prey, will reach the required depth to fool these hungry feeders. A host of different streamer patterns are effective at fooling pre-spawn Bass. Generally, if you’re fishing for larger fish, larger flies work best. If fly fishing for Largemouth Bass, The Fly Crate Lunchable Streamer Assortment is a great option and provides a collection of large streamers to imitate baitfish. Similar patterns to this assortment work well. If you’re fishing on a lake that holds a good population of Crayfish, Bass typically feed on these crustaceans during this time, too. Finally, line retrieval techniques are important when fishing streamers for these enthusiastic Bass. Streamers are usually stripped moderately quickly during this time of the year to imitate darting baitfish. After casting your fly over an area where Bass are staging, allow your fly to sink then retrieve it with short quick strips about 1-2 seconds apart. This action will catch the Bass’ attention and trigger a strike. Spawning Bass fishing presents a whole new target. As the fish move from staging areas to spawning beds, their feeding habits and demeanors drastically shift. As spring wears on, Bass migrate to shallow water to create beds and spawn. Typically, during the spawn Bass don’t eat. Instead, all efforts are focused on protecting their eggs until they hatch. Although they’re not feeding, this 15-20 day period of time can be the most exciting time to target big fish in shallow water. Topwater flies are the best choice to pull Bass off of their spawning beds and trigger a defensive strike. Because these fish are defending their beds in shallow water during the spawn, any quick movement on the surface is a threat to their young. Topwater flies trigger explosive eats on the surface and are incredibly visually exciting for the angler. Flies that work well this time of year include any poppers or surface patterns. The Top Water Bass & Pike Fly Assortment is a great collection of flies to get you started. Any flies that create noise, movement, or disturbance in the water should be given preference when Bass are defending their spawning beds. Again, during this part of the spring Bass season, quick line retrieval is ideal. Water disturbance or aggressive movement triggers a strike from spawning Bass. Thus, the more aggressive the fly movement, the better. Fly retrieval should be quickened as the fly passes over visible Bass in shallow water. Often when Bass are spawning they’re visible in shallow water and can be cast to and fished for with sight fishing techniques. If you can see a Bass, accelerate your fly movement just over the Bass to trigger a strike. Lastly, floating fly line is ideal for this kind of fly fishing. Intuitively, surface flies are meant to be fished on the surface. Thus, a weight-forward floating fly line is optimal for targeting Bass during the spawn. Again, a Rio Mainstream Bass Fly Line in whichever rod weight you’re fishing is a great floating line for spawning Bass. Because Bass are so aggressive during the spawn, leader choice is important, too. A leader connects the fly line to the fly and absorbs the majority of the force from an aggressive eat. Tapered leaders are generally the best choice when fishing for Bass in shallow water and, again, Rio makes a Bass-specific leader (Rio Bass Tapered Leader). The Rio Bass Leader is stout enough to hold up to toothy fights with Largemouth and Smallmouth Bass and comes in a variety of sizes to fit all angling needs. If you happen to find spawning Bass in shallow water during the 15-20 days during the spring that they spawn, I highly suggest targeting them. Eats are combative, fish are defensive, and the angling is highly visual. There’s nothing better than watching a large fish eat a fly on the surface in shallow water. Finally, as spring gives way to summer across the US, Bass finish spawning and enter a post spawn period. As Bass finish spawning, they move to deeper water and prioritize feeding first. Because Bass don’t ‘eat’ during the spawn (although they still grab topwater flies with vigor as a defense mechanism), they’re ravenous in the late spring/early summer during post spawn. Diets change back to baitfish and large insects and Bass begin their summer feeding habits. During the late spring post-spawn phase, Bass fall victim to changing the weather in many places across the US. As temperatures warm and lakes/rivers heat up, Bass typically migrate out of their shallow water spawning beds and into structure. This time of the year is when Bass turn to cover and ambush style feeding. Cover offers Bass both a shelter from the hot sun and a disguise to ambush passing prey. With this knowledge, fly fishing tactics should focus on cover and structure during the late spring post-spawn period. Submerged trees, large underwater rocks, drop-offs and other hideouts often hold fish this time of the year. Cover feeding often requires sink tip lines and changing fly tackle. Sink tip lines are important as Bass move into deeper water. A sink tip fly line brings an angler’s fly down to the feeding area of the Bass. Without a sinking fly line, Bass in deeper water are unreachable to fly anglers during the late spring. A line like the Scientific Anglers Sonar Titan is a great sinking line for deep water Bass fishing. 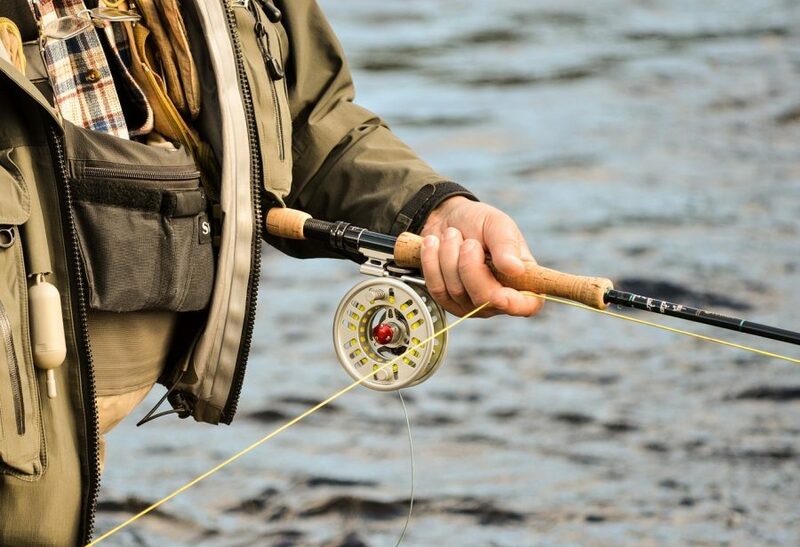 Sinking lines can often be more difficult to cast than floating lines, so a larger fly rod (8wt or 9wt rod) is most practical during this time of the season. If you rely on a sink tip line to bring your fly down deep to a Bass, heavy flies aren’t a necessity. That being said, heavy flies often help tempt these fish after they’re done spawning. Although the Clouser Minnow is often considered a saltwater fly, these weighted streamers also work great as post-spawn Bass fishing lures. Start with a Clouser Minnow Assortment until you figure out which color the fish in your area are feeding on. Post spawn fishing can be some of the most entertaining and the most productive Bass fishing in the entire spring season. One of the best Bass fly fishing tips you’ll get for this time of the season is to stick to deeper water, structure, and shadow and you’re sure to find fish. Upgrading your rod and including a sinking line will help lure large fish out of their hideaways. A slow line retrieval works best during this time of the year to allow your line and fly to sink into the Bass’ feeding zone. The slower you retrieve your line, the deeper it will sink and the closer it will be to Bass who have moved off their spawning beds and into cover. Weather, shelter, and time of day can also affect a fly angler’s success during the spring Bass season. Now that we’ve gone over tips and techniques for different phases of the spawn, it’s worth mentioning how these three variables play into Bass fishing during this time of the year, too. 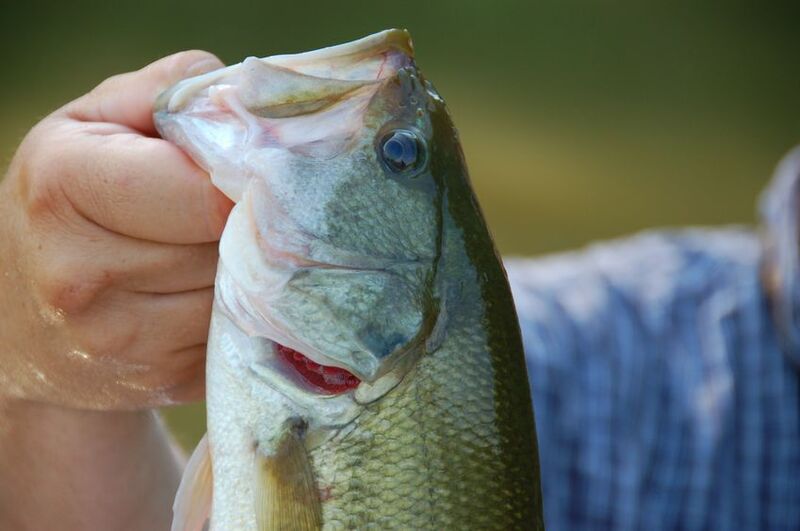 The weather has the ability to cause Bass to feed more or less depending on the conditions. If it’s really sunny and warm, Bass are likely disguised and sheltered under a submerged tree or rock pile. In the high sun, spend time fishing cover. When it’s overcast or raining, however, Bass are more likely to push schools of shad in open water or target individual or schooling baitfish. If it’s raining, Bass are less likely to remain in shelter, so fish open water drop-offs or flats. What kind of cover you’re fishing also dictates how the fish are going to behave and which flies you should use. If you’re fishing logs or submerged vegetation, Bass are likely feeding on smaller fish or large insects that are also using the vegetation as cover. Smaller flies that imitate shelter-seeking prey work best. In an open water situation where Bass are waiting on a drop off for schooling fish (like Shad), a larger fly that imitates a schooling baitfish is most productive. Similarly, time of the day also matters when targeting Bass with a fly in the spring. Bass often feed in open water during the cooler times of the day (morning and evening), and move into heavy cover during the hottest hours (midday). Fishing heavy cover in the early morning probably isn’t the most productive use of your time. These three variables are worth thinking about when targeting Bass during the spring. If you consider how the weather affects the Bass’ feeding habits and cover decisions, and base your angling time around the most productive times to fish, you’re likely to have more luck on the water. Lastly, each fishery and location has its own nuances and quirks. Bass act differently everywhere, spawning cycles occur at different times, and the most productive techniques aren’t always the same. While reading and researching is a great way to gain information and insight, there’s no better teacher than time on the water. If you want to catch more fish and have more fun doing it, take what you’ve learned here and apply it on the water. Spring Bass fishing can be difficult and frustrating, but it can also be loads of fun. Gear up, get out there, and catch some fish! This entry was posted in Bass Fishing, Fishing Tips & Other Wonderings, Fly Fishing on April 5, 2019 by Dorado. This is a somewhat random question; although, you seem extremely knowledgeable within the fishing community. I’m new to fishing and was wondering if fly fishing is the best method for catching bass? Good question Bill. While not the only method – you can also catch them using conventional or spinning gear just to name a couple of other popular approaches – fishing for bass on fly tackle is a blast. If you are new to fishing, however, the other two methods referred to here are easier to master, but don’t let that deter you from learning how to fly fish – it’s worth the effort! 2 Comments on My Tenerife Fishing Holiday: Small Fish, Big Fun!